If you were feeling dark or anxious today, how many of you felt comfortable enough to phone your boss to say you needed the day off because of it? Television personality Traci Melchor would venture a guess to say that not many of you would say yes – but that is something that needs to change, she says. Ms. Melchor brought her story of mental health in the workplace to local business leaders this fall as the closing keynote speaker at the Aurora Chamber Women’s Summit. 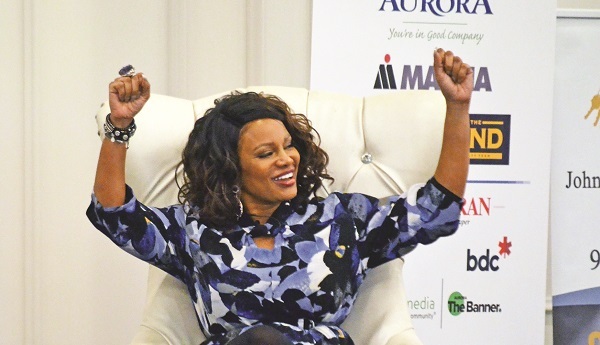 Hosted by the Aurora Chamber of Commerce at the Royal Venetian on Industrial Parkway South, the Summit’s theme was “Empower, Educate, Elevate,” and featured a full roster of speakers chosen to provide support for women entrepreneurs and provide advice to help women in business achieve their goals. Ms. Melchor, in a discussion hosted by Elvira Caria, shared her very personal experiences struggling with mental health and finding that all-important work-life balance. She started to notice her struggle, she said, a few years ago when she was chosen to co-host the CTV chat show The Social. At the time, she was already working on two full-time shows and was raising two children as a single mother. Supporting her in her battle with the rare DFSP form of cancer was Chris Hyndman, who co-hosted CBC’s lifestyle show Steven & Chris with his partner Steven Sabados. Ms. Melchor had her surgery and had to spend the six months of The Social’s first nine months on the sidelines before making the decision to go back to work. Shortly thereafter, Hyndman was found dead in an alley outside of his Toronto home, a death which made headlines across the country. But she wasn’t sleeping. She was burning the candle at both ends. If an author was booked to appear on The Social, she would diligently do her homework reading the book cover to cover – even if only for an eight-minute segment on the air. Another component of Bell Let’s Talk Day had her interviewing a mother who wrote a book about her son’s own struggles with mental illness, a fight which he ultimately lost. “I read her book and just got through it and every day before the show we would have a run through with the producer and I was just breaking down in my office,” she said, realising she just couldn’t do it anymore without taking time off to address her own struggle. In the first couple of months, she said she just couldn’t wrap her head around it. She liked her job and everything that came with it, but couldn’t understand “why my mind was failing me and not allowing me to be there.” She experienced guilt, she said, because she had never not worked, but she found the support she vitally needed from her employers, who connected her with a therapist she still sees today. In the end, she said it is important to be kind to everybody because you never know what that person just went through. If someone is “bitchy,” it could just be a symptom of something else. “If you are having an episode, feeling dark or anxiety, are we feeling powerful to go to our bosses or call in sick because you’re depressed today?” Ms. Melchor asked the packed audience last week.